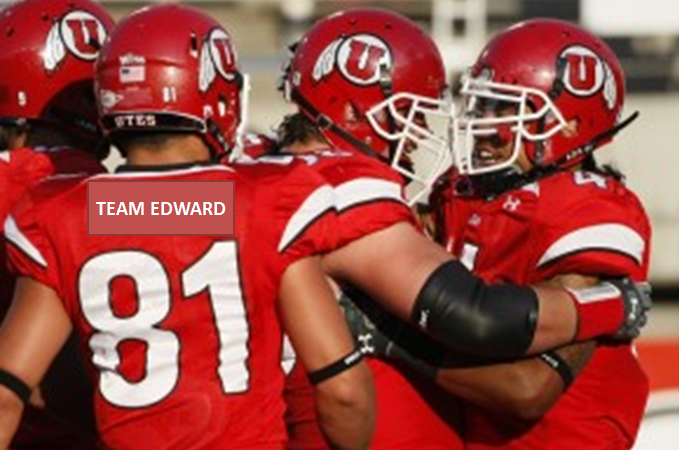 This Saturday marks the catastrophically-important and time-stopping date of the annual BYU/Utah football game. I have something to admit that may anger the people of the world. I don't care that much about football. I'll go a step further, although this declaration is not timely: I HATE the Superbowl. With a hot and fiery passion. In past years, I have purposefully planned flights during the Superbowl so I wouldn't have to be around when everyone else wastes a perfectly good Sunday in a dark cave staring at a TV so they can find out which of two teams that represent basically nothing at all is better at coordination and following rules on that day. I like playing football with friends. And I enjoy a college game every now and then. But I cannot comprehend the level of excitement for it of those around me. PEOPLE GET ANGRY ABOUT IT. I don't understand how people can care enough about this that they actually get angry about it. In Utah, when BYU and Utah face off in their annual football game, the whole state shuts the HELL down for about a week. And if you don't vehemently express blind and unwavering fanatical loyalty to one of the teams, EVERYONE is your enemy. So in order to have a people, those of us who would like to side with team apathy choose a school to express interest in if ever cornered. In past years I also prepared a rote memorization list of three or four logical reasons I chose the allegiance that I did, but as I've aged, I've discovered that nobody cares about the reasons. There are two football teams and you are supposed to be willing to sacrifice your first born for one of them while viewing the other as the ultimate epitome of evil for absolutely no reason at all. And, look. I went to BYU. For eleventy years, give or take. I'm proud of my alma mater. I like when it succeeds. AT THINGS THAT ACTUALLY MATTER. When I find out its accounting program is ranked number one in the nation, I silently beam in pride. When my law school classmates secure highly competitive and prestigious clerkships, I'm even more proud to tell people that I was educated at an institution that churned out such impressive individuals. If Paul Simon visited BYU, I would paint my whole house blue and drink cougar blood. But football? It's fun to play. It's fun to watch, I guess. But why is our (BYU) success (or SEVERE lack thereof) in it so freaking defining of a gigantic institution that actually has impressive statistics to flaunt? Statistics that equate to preparations for a stable livelihood and, from a cultural-religious standpoint, perhaps even evidence that practicing what we preach produces a desirable quality of life. But whenever I tell anyone, anywhere, that I attended BYU, they immediately comment on the school's football program. That, plus they often add some offensive joke about my religion that I'm supposed to smile at and "not take so seriously." I know it's fun. I know team rivalries bring excitement to communities. Heck, I'll even admit that I'm looking forward to the game. But in the state of Utah, the BYU/Utah rivalry extended beyond the very outer bounds of rationality so long ago that comparatively it seems like I have absolutely no interest in it at all. The extreme fanaticism of the whole thing is as sensible to me as is the fight over Team Edward and Team What's-His-Name. And, in fact, this week as I've heard everyone around me every minute of every day yell, post, and argue about how their chosen team is charged from GOD HIMSELF to humiliate the fans and players of the other team, I immediately imagine that they are actually just arguing over Team Edward and Team What's-His-Name. Jacob? I really wish I knew how to look stuff up on the Internets. Ugh I'm with you on every level of this post. I hate football too. I don't hate the Superbowl as much as I like the Superbowl commercials, but it's close. Love the pictures! At least you're tech savy enough to know how to edit pictures. I'm impressed. Yeah, I don't get it either. It's just a game. 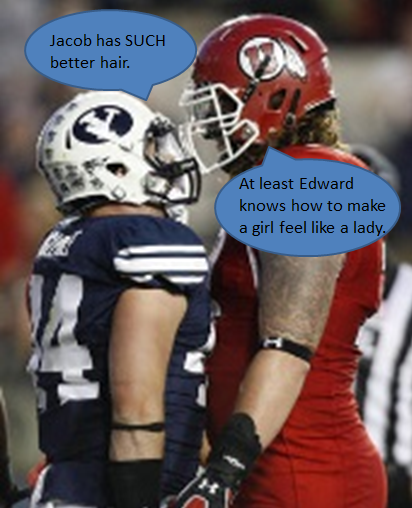 Now every time I am force to watch a football game I am going to imagine them fighting about team Edward or team Jacob. I might actually enjoy the game, I still won't get all the hype, but it will be more entertaining. It is because you don't get it!! This is the first of your post that I quit reading as soon as start bashing others just because YOU don't do it. This is a terrible post. Would have thought you, with all your "let's all get along" talk, would avoid alienating so many of your readers. Statisticly, you and the other four readers that agree with you are in the minority. Good day, sir! Satire. Look it up. I thought this post was hysterical. This wasn't bashing. It was about how he doesn't understand why he's an outsider on this. Eli is not the only person who feels this way toward football . Maybe he just see's football for what it really is: a game. I like to watch football every now and then but would never berate a person for not sharing the same opinion about football as I do. You are entitled to your own opinion. So is Eli and the rest of us who just don't get the obsession with a game. You are exactly the person (type of people) Eli was writing about. You have absolutely made his point for all of his readers that might otherwise not have understood. "And because you are in the minority, your opinion is less valid than the rest of us. Good day to you." I have a fond memory of the rivalry game that happened Thanksgiving weekend of 2006. We were visiting my in-laws and my father-in-law said we could go get a Christmas tree if everyone promised not to listen to the game. It's not that there are in-house rivalries--my wife's family is loyal to BYU. I grew up in a very sports-indifferent home (the only sports anyone ever watched was when my Dad watched March Madness, and not to root for anyone in particular, just because he likes college basketball I guess), so I am pretty indifferent (at least I pretend to be; I really know that U of U is headed by Satan himself). The problem was that her brothers were so passionately loyal that if things didn't go well for BYU, they would get gloomy or upset and mope around all afternoon. And no one would help decorate the tree. We got the tree, but soon enough people were trickling off to listen to the game (it was a close one that year). I eventually found myself in the kitchen while my wife helped her dad finish decorating the tree. My mother-in-law was hunkered on the counter anxiously listening to the radio commentary about BYU's final drive (I think, I could have the details wrong). That's when that one guy caught the pass on his knees in the endzone to win the game. She jumped up and cheered and everyone was ecstatic except my father-in-law who was annoyed about the whole tree thing. Good times. Now, let's all get along and go start smacking kids in the supermarket. Anonymous, chill out! I guess I must be one of the other four people that don't care. Who are the other three people? I didn't know the Queen of Colors was a fanatical football fan and went by the name "Anonymous"!!! Good grief! I wonder how long it took her to peck every single one of the keys to write this post! No wonder there are so many spelling and grammatical errors. She was too busy pecking away deliriously in her football frenzied fervor to check that, I suppose. Well, good day to you too, Queen of Colors! We all have your number now! I believe Anonymous has his/her numbers wrong. It would appear that MOST of Eli's readers (or at least those of us who care to comment) are actually on Team Apathy with him. That's way more than four. More like eleventy billion or so! What the???? Anonymous? Anyway.....Moving from Chicago to Alabama, I had absolutely no clue what my postman meant when he said "Roll Tide!" to me before we left. Boy, do I now know! We have Auburn fans on one side and Alabama fans on the other. We tried to stay neutral, but have finally been brought over to a side (Alabama...because we are more afraid of that neighbor, but in a good way, because she really is a very nice person). I, personally, really enjoy watching the game and am one of those that are screaming at the TV, much like I scream when my kids do well on the soccer field. It's a game. It's fun to watch or play. It's a distraction you can do with friends while not thinking about the thousand things you should be doing. It's football!! As soon as I saw football mentioned, I thought "Ugghh! The Alabama/Auburn rivalary is just like this!" Most of my family migrated to Alabama in the 90s and though many of them live elsewhere now, they are all still avid Alabama fans. My youngest sister,Rachael married an Auburn fan and converted, they are now raising Auburn fans. That is sacrilege according to my oldest sister's husband, Wayne. When Wayne's 14 year old son turned Rachael's 6 year old daughter into an Alabama fan, Wayne decided there was still hope for the future with the other two. Yeah you know how those family gatherings go! I am on Team Apathy as far as actually watching football. However, oddly now that I live in TN, I am surrounded by Alabama fans at work. I consider myself one of them since I lived there and most of my family are fans. When 2 of my sister's married out of state men, then the birthday and Christmas gifts came for the kids. Kansas Chiefs and Denver Broncos. Baby oneies, shirts, toys for the kids all in the rivals team name... poor kids didn't even know that they were the center of the game. Me, I just go for the food and half-time I could care less and so could my husband. However, Eli is right... look at what one of our news stations ran. Blue/Red, hey isn't that Gnomeo and Juliet's teams? Team Daniel! Oh, and also, HTTR! Good job being honest about this. I don't understand all the EMOTIONS people have around football either. But you are COMPLETELY wrong about the other. Team Edward!!! The only reason I know it's football season is because I see posts/blogs about it. There have been many superbowls that I don't even know who is playing against who. The only reason I know the superbowl is usually in Febuary-ish is because it was on my daughters birthday once. My husband is not a sports fan either. Makes Superbowl Sunday just regular Sunday at our house. It's okay that you don't get the crazy, over-the-top emotions that go with football, my husband doesn't get it either; however, I personally LOVE football and the irrational excitement is part of what I enjoy about it. It doesn't make any sense when I tell my son he can like any team except the Raiders, Cowboys or Broncos. Those are the teams I can't stand (again for no good reason). I don't mind that you don't get it, just stay out of my way when I'm doing victory laps around the house like I'm personally responsible when my team succeeds. Seriously though, I love football. But here's a question for you mr. I LOVE SURVIVOR! What gets you so excited about some bozo's on an island fighting to stay alive and not crack a fingernail vs football? And although I love Paul Simon. What makes a singer so much more important in this world, then a Football player? Both provide entertainment. Just playing devils advocate. To each their own. Oh please don't go there. What makes a singer more important? I'll give you the argument on the grounds of crap-tastic performers like Justin Timberlake, Lady Gagme, and the other money-grubbing, over-produced, mildly-talented celebrities that pass for singers these days, but when you bring a genius like Paul Simon down to the level of a sweaty 300 lb guy in spandex, YOU are the one who has crossed the line. Football players put in a lot of hard work and practice and an admirable level of focus to achieve high physical performance, but in the end, when they're grappling with each other over the that little pigskin ball, there isn't a whole lot that a spectator can gain from that. I recently saw a disgusting commercial about how men have always watched stuff (like cavemen watching a fire, romans watching gladiators) and so watching sports is what we were born to do. That mindset reduces humanity to a set of savage animals. When an artist like Paul Simon performs his craft, his words, his music, his thoughts, can change the course of a person's entire life--can inspire, can lead to epiphanies, can foster strength, courage, love, compassion, gratitude, joy, peace. It's the same with the great painters, sculptors, poets--art edifies and instructs and pushes us to be greater. Art makes us more humane; sport makes us less. That was the best response EVER. I just thought you should know. Wow, seriously, it's called teasing. You're taking this stuff way too seriously. Really? You think that was the best response ever? Wow. That's pretty sad. Anyway....as I was saying, I was just playing devils advocate, but if you want to discuss this like an adult instead of flipping out like you just did on a ridiculous subject I can do that. I'm not disagreeing with art being wonderful for society. I am an artist myself, but I still enjoy football. But to say that Art makes us more humane then sports is just a closed minded comment. Without sports, we'd be a bunch of fat imbeciles who sit around all day. Sports help us to learn team building and how to work together. Sports help us to see how far we can push ourselves and teaches us how to build strategies to accomplish a goal. Sports help us to keep our bodies tuned up and our minds more fit. Sports help us to live longer and stay healthier. That being said, there are 3 parts to all of us which we need to keep in balance. Mind, body and spirit. If a person were to focus solely on the body part, e.g. football, then yes, that is not healthy and can lead to imbalance in life and in self. Especially if they're just sitting on their can watching the sport. But you can't say that sports makes us less humane. That's why people should teach balance. You focusing too much on art, is just as bad as some dude focusing totally on football, or someone else eating big macs all day. It's not healthy. Tell me exactly how an artist (specifically someone who focus's totally on his/her art) who thinks he's better then anyone else, who (for example) sticks a toilet bowl in the middle of the room and calls it "art", how is he so much better then a football player? I've seen plenty of "artists" who treat others like dirt and are just a bunch of snobs who make less humane. I've seen good artists and bad artists. Just as I've seen good football players (especially ones who do football training camps for kids) and bad football players. Keep an open mind to things. Not everything is black and white. And again...as I said before...I was just bugging Eli and playing devil's advocate. ... THAT is your idea of discussing this like an adult? "What makes a singer so much more important in this world, then a Football player? Both provide entertainment." I gave the example that, at their worst, singers provide only entertainment, but at their best, they do more than that by inspiring and lifting the human spirit, encouraging positive behaviors, and opening people's minds. This is what all the best artists do. Do I find value in your hypothetical of the toilet bowl exhibition? Well, I haven't seen that. In the USU art museum I did see someone who had used canvas to create a three dimensional realistic-looking washer and dryer combo as part of an exhibit that encouraged us to take a closer look at the mundane and ordinary things of life. Some people may have derived a great deal from that exhibit. It may have been lost on others. Or maybe that really is just bad art by a bad artist. That guy will not be in the "super bowl" of artistry. My point is that a good artist will contribute more positively to society than an athlete. Your counter-argument then should be something about how athletes can be good role models. They, too, have the capacity to inspire. Maybe they inspire perseverance, goal-setting, overcoming obstacles, hard work, dedication, focus, etc. I think in certain contexts, when you look at an athlete's life and achievements, you can make that point. However, I don't think that those lessons tend to come out in the spectacle-oriented, super-hyped exhibitions churned out by the corrupt and greedy organizations that hold the reins in the world of sports. Maybe that makes me just like the average college student standing there looking at the washer and dryer saying, "so?". But I will stand by my assertion by restating it: a great artist's work contributes more to the good of humanity than a great athlete's. As an illustration, can you name any painters or sculptors from the renaissance? Can you name any athletes who performed in the first olympics? 500 years from now, Paul Simon will be taught in humanities classes; Michael Jordan will be an unknown. Oh, and thanks for taking the bait. AH...CURSE YOU...you baited me! Oh well...I like bait...it's tasty. Yes, you make good points. But originally you stated the sports make us less humane. That was my beef with your argument. You also seemed to lump all football players into one basket. But otherwise, yes, I agree. Paul Simon will be remembered long after a known athlete. But, a football player can inspire someone with his athletic ability, just as Paul Simon inspires someone with his music...just in different ways. But football, like almost everything else on tv, is pretty much just crap for people to watch. It's entertainment. But it's no worse then some stupid show like Survivor or Cougar Town or something. So making a big deal about football is just as bad as making a big deal over any other show out there. I know way more about athletes than I do about Paul Simon. And I also know the difference between the words "then" and "than." I also believe that people will know who Michael Jordan was in 100 years. After all, I know who Honus Wagner was. And George Ruth. (They both played baseball over 100 years ago.) And Bob Dylan is better than Paul Simon. But this is only my opinion. Just like Lee has his own opinion. And the many "anonymouses" have their own opinion. I grew up in Alabama so I know the pressure (at a young age, I might add) of having to choose a side in a sport that holds less than no interest for me. Now I live in Utah and the only reason there is less pressure is because I live 2 hours away from Provo. I do however enjoy Superbowl Sunday cause we get to fast forward through the game to watch funny commercials and eat fun finger foods. Twice up the barrel! my mom went to BYU and BYU vs U of U games usually consists of my mom wanting to relive her cheerleader years by getting really upset whenever "something doesn't go right" but in reality she doesn't really know what's going on so my entertainment comes from her yelling " homerun!" every time someone scores. definitely team apathy! Yes. Exactly. Completely agree. Both on the football opinions. And listening to people make rude comments about your religion. (I am Catholic. Heaven forbid. But I love the Mormkn boys who visit regularly.) Also, we really need an update on Daniel, so we can have closure and start loving the new guy with minimal guilt. Maybe you could do that post during the senseless football game? I live and die by Utah football, but I wish that it was September 22nd already so everyone could move on with the rest of their lives. I graduated from Utah, my kid brother graduated from BYU, so my mom cheers that "everyone has a good time" rather than picking a side. That seems like something you might try. It is not gone with the coconuts! Just took a couple weeks off from it because I've gotten behind on many things. It will be back next Friday. Sorry for the delay! Let's start by telling you that I am an Alabama fan, born and bred. I had an uncle who played football at Alabama, was born a few miles down the road from Legion Field, and let's confess it, nothing succeeds like success. I like football a lot. I watch the Tide on TV most Saturdays during the season and usually parts of other games, and then watch all or part of all three pro games on Sunday while checking the progress of my three fantasy teams. This Saturday is different because I'm in a play and we have two shows. I am considered odd by two circles of friends that barely intersect at all. Fanhood can make people a little crazy. Sometimes very crazy, and college football brings out this craziness like few other things. People will spend more than they can afford travelling to games, form or abandon friendships over it, and decorate their homes, workplaces and cars proclaiming their undying devotion. It doesn't speak well of me as a man that I enjoy baiting the fans of other SEC teams as much as watching the games. I tell Tennessee fans that the players wear orange so they don't have to change when they go pick up trash on the side of the road. I can't defend this behavior, but there it is. BYU has a football team? I have never understood why people are so into football either. OR when they get angry...I don't get it? I think, you didn't lose your family, you aren't bleeding from the ears, you have income and food on your table. Why is THIS team running your emotions? Weird. Wait....there's a football game this weekend? Anger about anger = META ANGER. Deep, Eli. Deep. Eli you have missed the point. Do you not know about the football food. It is the whole reason our family has the party. I could care less who is on the screen, how many points we have as long as the hot baked 1200 calorie dip is on the way. Woo Hoo. Let's go team. Eli, you do care about football. You wrote about it. You just don't like it. I am with you on that one. My husband played football for BYU, so I guess that makes us BYU fans. This year, my son is all about BYU football and we somehow ended up with a BYU flag that hooks on your car window. He's 10, and he likes to fly the flag on the car. I guess I don't mind except that the flag wiggles if I drive fast it makes a thud-thud-thud sound. I forget about it until I accelerate and then I scream "WHAT IS THAT SOUND!" while I wildly check the gauges and pee my pants a little bit. Go COUGARS....said the attractive woman with wet pants. AH! I couldn't agree more! It was like a death sentence in my family. They are evenly divided when this week comes around! Thankfully this year I am not around for the game, but every year I would request to work so I couldn't avoid the mayhem and the traffic! So yes. Go Team Apathy! My friends, this is a stupid argument. We all have interest, hobbies, addictions, passions or whatever else that seem irrational to others. I personally love football. Whenever Alabama plays I stop whatever I am doing so that I can watch and cheer for my team. Others love musicians and do the same for them whenever that musician comes into town for a concert or whatever and that's cool with me. We need to learn to love each other for who we are and what we do. There will always be something that seems irrational to us and makes us want to scream but we need to remember that others think the things we do are irrational too. It goes both ways. But when you look past what the person loves and see that they at least have a passion for something (even if it seems irrational to you) that is when you realize that we are all the same. We all have something that we love so why don't we just accept each other for who we are and what we love? If you want to talk about religion because this is the "Holy War" you are bashing then realize that Christ has asked us to not judge others but to love them and serve them no matter who they are or what they believe in. My dad and his brothers don’t care that much about college football, but they are die-hard, scream at the TV on the verge of tears Rams fans. Many of my baby/childhood photos involve one or more of them in the background, jumping off the couch with insane expressions on their faces while the Rams are on the TV. I somehow managed to not care about football at all (though I enjoyed Super Bowl parties, what’s wrong with you?) until I discovered Clay Matthews. Maybe if you had a player to obsess over and dedicate a Pinterest board to, you’d like football better, too! You might even learn that there is a science to the game, like I did. It's the same in Texas. I attended Texas Tech University, and our big rival is University of Texas. It's insane how mad people can get about these things. There are people that won't associate with others because the root for the "wrong" team. (I'm in my 30's working for a professional corporation, this ain't high school) It's nauseating to listen to people endlessly talk about the games and get SUPER bent out of shape when someone else mentions a rival team, but especially UT. Seriously, I. Don't. Care. Eli puts a lot of time and thought and heart into these posts. He makes people smile and laugh and think and feel things right along with him. He has a n entire following of people who love him and his Blog, his friends and his family. We all love pretty much everything he writes. If you have issues with it, then please, for the sake of the hundreds of others of us that DO enjoy his posts and points of view, and even those who are able to have opposing points of view jn a non offensive way, discontinue reading them immedietely, and begin your own negative argumentitive Blog elsewhere. Good day to you. I have season tickets to BYU football, but I love going because it is a family event with my two brothers. All I have to say is good for you. Honesty is always the best policy. The comments on this are such poetic irony. Eli's opinion on over the top football fans has bred a conversation about his opinion that is every bit as over the top as the football fans he spoke of to begin with. The line about offensive religious jokes made me laugh out loud. I think we sometimes forget that this is Eli's personal blog about his life and opinions. For shame, strangers. For shame. Where can I get an application to join Team Eli? Just another reason to love you! As a BYU grad, I feel the same way about football! Once up the barrel, twice down the side. Eli knows so much about Twilight it's no wonder he doesn't like football! Hear, hear! Have never understood the absolutely outrageous emotions behind this event. Uh oh...look what you've done! You've created a monster! Move to Logan, up here we only care about our Aggies. No really, the only time it gets crazy is just before the basketball game against BYU, cause we have little dog syndrome, so sometimes we go to the store and buy toy lions (no one makes cougars, can you believe it? ), and we decapitate them and hang them all over campus. Also, a great remedy for rivalry week; buy an Aggie T-shirt that isn't even our colors (like lime green), and wear that on game day. People will leave you alone. Trust me, I grew up in salt lake and did this for many years. Speaking as a man, I want to be heard as one who comes from a different side of the line and LOATHES football with a fiery burning passion. It doesn't matter. I grew up constantly hearing how boys play sports and girls play with dolls. I played t-ball, and soccer, and basketball. I only ever enjoyed them because of the much anticipated snow-cone, fruit snack, Capri-Sun, or what-have-you after the game. I hated practice, I hated playing, and I hated going (until I was coaxed by high fructose corn syrup laded goodies of afterwards). When I grew older football was the sport that really mattered. And it seemed to be a rule that you had to love it and had to worship it and give it your whole heart and soul, whether that be on the field, or on the couch. I couldn't play because of my naturally small person, but I watched the Super Bowl and could never understand what the heck was going on. Eventually I bagged my "give-a-care-at-all" attitude for it and just watched for the commercials. Even those became stupid, humorless, and degrading over time, so I began to hate football. I didn't want to live the stereotype any more that said all men must love football more than life and put it before all else (except maybe God himself, if I get the correct image from BYU), and I began to openly hate all that football stood for. Another increased hatred came when I saw my friends who attended both The U and BYU start to tear their relationships apart because of this college rivalry. It disgusts me, especially when BYU represents the church I am a part of and takes such aim at belittling others who just don't go to the "Only God Blessed School In The World." I feel like BYU is not as Christlike as they should be. And The U isn't much better, dumping beer on the BYU fans, etc. The University of Utah also represents Salt Lake, which is also another image others have of the LDS church, and it should do better about that too. Men don't have to love football to be correctly considered manly. I've worked with mechanics for as long as I can remember. I've actually spent a few years in a career dominated by men, machining. I think carving metals into elaborate 3D models that make our world operate is pretty cool. I may fit other stereotypes, but I will not accept football. Life moves on without ever a care of who won a stupid game. I'm with Eli, football is dumb. Eli started a civil war on the internets. I like watching football, just like I like watching other tv shows. I find it entertaining and I like the strategy that goes into it. It's more fun if you have a stake in the game so you have someone to cheer for. Rivalry games can be fun - some good natured ribbing never hurt anyone - but when it spills out into other arenas of life, I agree that it's ridiculous! Drivers cutting off others drivers with a rival's sticker, people getting into serious fistfights, fans poisoning the other team's trees? Craziness!! P.s. Youtube the Rice Onside kick, pretty awesome. P.s. Youtube the San Jose State Onside Kick, not pretty awesome. P.p.s. I googled 'awhile' to see if that's the proper way to use it as opposed to 'a while'. Hope I got it right, English!?! P.s. Google picks of Pau Gasol before and after he shaved his beard, weird. P.p.s. Wooa, went a little NBA there for a sec, back to football. Bythe way Eli, do you just hate football or is it all sports. P.s. Did you know Taysom Hill(BYU quarterback) played highschool football in Idaho! Awesome right! P.p.s. Do you actually know what a quarterback is? You claim to have played football, but you might have actually been playing rugby, or perhaps soccer depending on where you supposedly played. IT'S ALL OVER! IT'S ALL OVER! Incomplete pass, end of fourth, end of game. Utah wins over BYU 20-13. P.s. did you know that Idahoans call BYU, BEE WHY WOO, it's actually pretty fun to say. We don't hate BEE WHY WOO or U of U, it's just fun to say. BEE WHY WOO, BEE WHY WOO-EYE, BEE WHY WOO-HA WHA HEE! The End... FOR NOW! dun, dun, duuunnn. When you combine Red and Blue the color you end up withe is Purple! So you should really root for Weber State University. Except in Cache Valley where we don't care who wins as long as it wasn't the team that beat the Aggies earlier in the season. If we can't beat both the cougars and the utes then we want domino math: Utes beat us, BYU beats the U, we beat BYU. That way each team has one win and we're all equal...keeps the fans from getting too cocky. Wait. You're supposed to care who wins the Super Bowl? I thought it was all about the excuse to eat lots of food with friends while playing board games and being judgmental of commercials that people played an exorbitant amount of money to air. Here in Michigan we have our Michigan/Michigan State football rivalry, which people can get pretty passionate about. People even burn couches over such things in East Lansing. I still don't get it. I even went to school in the South where it's a BIG DEAL. I do think people may be more forgiving of my lack of caring because I'm female, which is funny considering how many die hard female sports fans I know. If they really push me I tell them my alma mater is undefeated because we haven't had an American football team in, well, a very long time - like the 50s - but we had Bear Bryant when we did and apparently he was some sort of big deal. Or something like that. I am a transplant to the Green Bay, WI area. I don't even own a T.V., but I always know when the Packers are playing a game, because EVERYONE, including children, the elderly, and small pets, are wearing green and gold. I could truly care less, but when I recently saw a Chicago Bears t-shirt on the clearance rack at a store, I bought it just so that I could annoy the heck out of all the obsessive Packer Backers. Best $5 I've ever spent. I also used to teach lessons at a private music school. Once, we had a Sunday afternoon recital scheduled for the children to perform. The week beforehand, the director of the school informed us that we needed to re-schedule the time of the recital. Why? Because it conflicted with the Packer's game. The director was worried that the PARENTS wouldn't come to their children's music recital. Because of the football game. REALLY?? So depressing. Is This What Kurt Does All Day?